Interurban Railway Company Installs Projecting Machine on Party Car with Pleasing Effect. Moving pictures have found their way into a new channel, this time being used by street railway managers for the entertainment of passengers who charter private cars for long runs. The Pittsburgh, Harmony, Butler and New Castle Railway Company, with general offices in the Diamond National Bank Building, Pittsburgh, Pa., and whose lines extend from Pittsburgh to Butler thence to New Castle, Pa., is the first road to use the moving picture machine. The Party car, in which the first machine has been installed, is a rebuilt car, for this piece of equipment was badly damaged by being in a wreck not many months ago. When the car was rebuilt, General Superintendent Harry Etheridge conceived the idea that a Party car with a moving picture equipment would be a new traffic producer. When the matter was given serious consideration, it resulted in the most modern motion picture machine on the market being bought and installed in the rebuilt car, it being attached to the inside of the roof on the rear platform. A small platform three feet square was built and high enough for the operator to stand upon to work the machine. When the trip is ended, the platform is lifted out of the way of passengers alighting, from the car. The screen is in the front of the car, and directly back of the motorman. This is lifted and lowered just as a blind is in the home. It also serves as a blind for the motorman, no light penetrating through the screen, thus giving the motorman a clear vision with the headlight of the car. The electric lights in the car are turned out after the trip has been started, and all is ready to start the reel. Window curtains are drawn, and the car then resembles a cozy theater on wheels. Two reels of pictures are shown and these reels are never repeated. Reels of the longest length are demanded by the company, for the longest trip the car makes is about two hours—this while being operated as a special between New Castle and Pittsburgh. When the car is returned to the barn after the return trip at night, the reels are forwarded to Pittsburgh on the first car the following day. When the car is to go out again, an advance order is sent to a Pittsburgh film exchange, and new subjects are then sent to the company. It frequently happens that the company is compelled to send out two special cars on order for private parties, frequently 100 or more passengers forming theater parties from New Castle and Butler to Pittsburgh. On the trip from New Castle to Pittsburgh, say 50 of the party use the “party picture car” on the “going trip” and then the pictures are run. 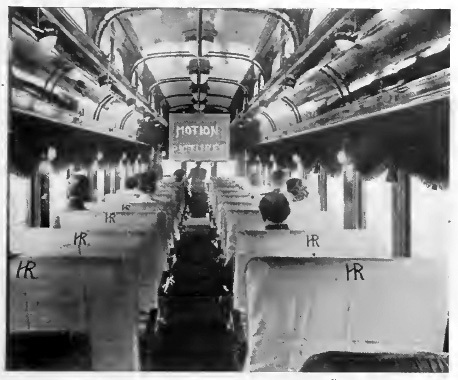 Then on the return trip, those who rode in the regular special car change places with those who rode in the Party Car and for their benefit the pictures are run on the return trip. The Party Car is becoming a most popular feature with the company, and is now in demand practically five nights out of a week. It is handsomely furnished, clean white linen being placed over the back of the high seats every time the car is chartered. The appointments of the car are perfect. Lunch and card tables are at the command of the passengers on the Party car, individual electric lamps being placed on each card table and at each seat for this purpose. Questa voce è stata pubblicata in Cronologia 1912, Tecnica e contrassegnata con vecchie sale di cinema. Contrassegna il permalink.